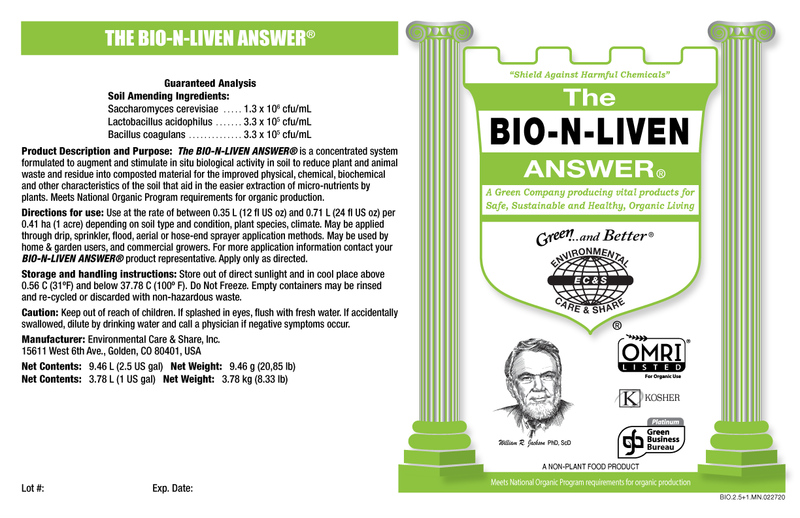 What is THE BIO-N-LIVEN ANSWER® & what is its purpose? THE BIO-N-LIVEN ANSWER® is a complete system for microbial stimulation and works enzymatically with plant growth hormones to enhance a plant’s fullest potential. It’s a biological, multi-enzyme product that electrically charges, stimulates and accelerates beneficial, dormant microbial life (bacteria, fungi, algae, actinomycetes, etc.) to rapidly multiply and become more efficient in converting waste, compost, fertilizers and soil nutrients into valuable plant food. THE BIO-N-LIVEN ANSWER® accelerates the decomposition and deodorizing of plant, animal and commercial residues by dispensing oxygen and deriving energy from the oxidation of simple mineral compounds and organic gases such as ammonia, hydrogen sulfide, carbon monoxide and sulfur dioxide and by doing this it accelerates biodegradation and stimulates natural plant growth hormones. It’s so well-balanced that it can withstand a wide range of temperatures, pH and other environmental conditions. THE BIO-N-LIVEN ANSWER® has proven to provide a more complete and balanced range of nutrients that will be taken up faster for improved plant growth, strength, and immunity, as well as increased crop production. THE BIO-N-LIVEN ANSWER® is so effective that is can cause one microbe to multiply to one billion in a twenty-four hours. What's in THE BIO-N-LIVEN ANSWER®? 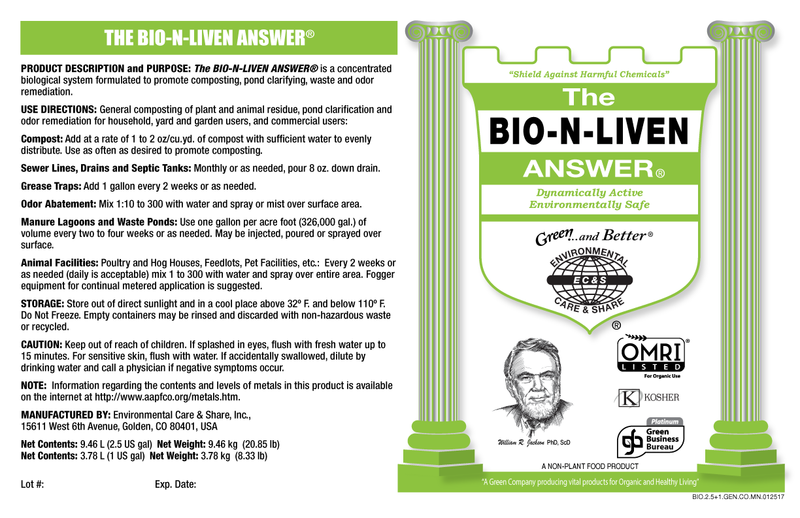 THE BIO-N-LIVEN ANSWER® is a highly concentrated, multi-component biostimulant containing a complete system of an ecologically balanced mass of probiotics, autotrophic, aerobic, and anaerobic enzymes, co-enzymes, exo-enzymes, multifactorial inducer molecules and vitamin precursors of plant and animal origin. Each ingredient was specifically chosen because of their effectiveness in meeting the needs of soil component breakdown and nutrient release. Among other benefits, these groups are most proficient in the conversion of ammonium-nitrate to nitrate-nitrite; cellulose degradation; fat, triglyceride, and protein breakdown; oxygen production; and pH balancing. THE BIO-N-LIVEN ANSWER® doesn’t contain any living microorganisms. DISCLAIMER: Microbial multiplication can be reduced or inhibited with the use of (1) antibiotics, (2) disinfectants, (3) copper sulfate in footbaths or ration, (4) chlorinated water, (5) high or low temperatures, and (6) pH factors. Compost: Add at a rate of 1 to 2 oz/cu.yd. of compost with sufficient water to evenly distribute. Use as often as desired to promote composting and odor reduction. Sewer Lines, Drains and Septic Tanks: Monthly or as needed, pour 8 oz. down drain. If unsure if the location of a slowdown or blockage, start at an entry point closest to the final drain target location, such as the main sewer line or septic tank and work back up the line. Grease Traps: Add 1 gallon every 2 weeks or as needed. Odor Abatement: Mix 1:10 to 300 with water and spray or mist over surface area. Manure Lagoons and Waste Ponds: Use one gallon per acre foot (326,000 gal.) of volume every two to four weeks or as needed. May be injected, poured or sprayed over surface. Animal Facilities: Poultry and Hog Houses, Feedlots, Pet Facilities, etc. : Every 2 weeks or as needed (daily is acceptable) mix 1 to 300 with water and spray over entire area. Fogger equipment for continual metered application is suggested. 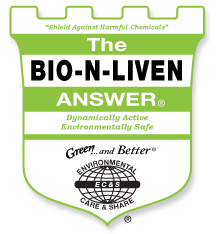 THE BIO-N-LIVEN ANSWER® is packaged into a 2.5 gallon container to fit your application needs.